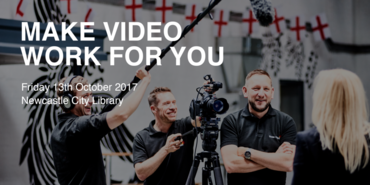 Make Video Work For You: is a masterclass for businesses and public sector organisations of all sizes, looking to understand how to best use video and animation to support and drive their promotional, training and corporate needs. The region’s leading production agency Three Motion Media, will be delivering the free morning session, so whether you are a small company looking to create your first promotional video, a large trust looking to capture or promote a forthcoming conference, a global brand owner looking to launch your new product or a training consultancy looking to improve your learner experience with professional online content, join us. The session will be fun and interactive, with real project content used throughout the event to explain the techniques and tools available, and the chance to get hands on with some of the equipment used to create content professionally. We will also cover the effective deployment of content to reach and attract big audiences online. With over 50 years of industry experience (between us), our team is an enormously talented group of individuals, dedicated to producing video and animation to the highest standards. We are hugely passionate about our work and take pride in every project we are involved with.